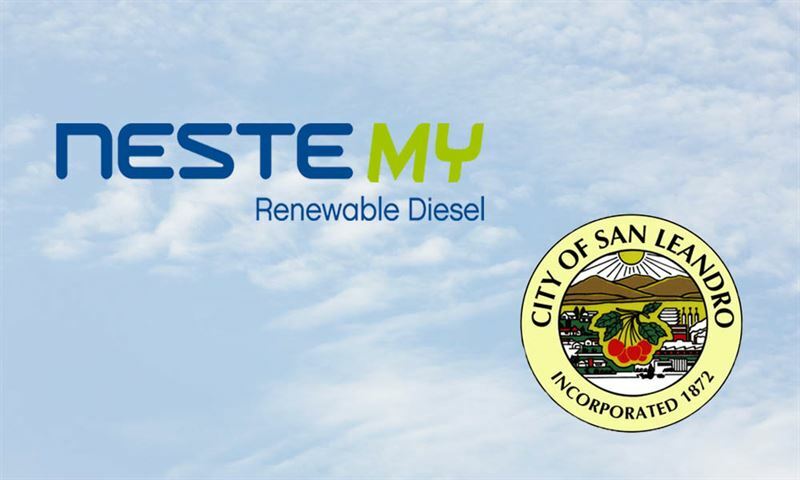 The City of San Leandro, a suburban city in Alameda County, California, has switched all municipal vehicles from using petroleum diesel to only running on Neste MY Renewable Diesel™. Neste MY Renewable Diesel is a low-carbon diesel fuel produced from 100% renewable raw materials. This premium diesel cuts greenhouse gas emissions by up to 80% and enables reductions in engine-out emissions, all while enhancing fleet performance. Unlike biodiesel, Neste MY Renewable Diesel is a drop-in fuel that requires no blending, and is compatible with all diesel engines. San Leandro operates approximately 160 vehicles. The city decided to make the switch as part of the city’s Climate Action Plan, which aims to reduce greenhouse gas emissions by 25% below 2005 levels by the year 2020. Western States Oil, based in San Jose, California, is the exclusive distributor of Neste MY Renewable Diesel to the City of San Leandro.